Meticulously designed by the Royal Canadian Mint and produced exclusively for APMEX, the Grey Wolf Silver Coin celebrates Canada's wilderness and is struck in a unique weight of ¾ oz. With a silver content of .9999 fineness and a radial line background, the 2015 Grey Wolf Silver coin represents a limited-edition piece befitting of any coin collection and investment portfolio. Why buy 2015 3/4oz Grey Wolf silver coin? The ¾ oz Grey Wolf is a dealer-exclusive silver coin produced by the Royal Canadian Mint (RCM) – one of the leading bullion refineries in the world. With a limited edition of just 7,500 silver proof coins in circulation, the coins represent a worthy collector's item, and early adopters get the benefit of a low premium so order your coins soon. Not only that, but these coins contain 99.99% pure silver, the highest fineness of silver coins, and given they were minted by the RCM investors can be assured that the coins have been produced to premium quality using the latest minting technologies together with a high level of security measures to protect the coins from fraudulent copies. Not only are the coins unique in their design, but also their weight. Struck with a diameter of 3mm and a thickness of 2.5mm, the coins weigh ¾ ounces (23.3g) rather than the usual 1.5oz. of previous wildlife coins. Although the coins carry a face value of $2 Canadian dollars (CAD), they are worth much more in the current market and can be purchased individually or in mint-tubes of 30 units. With only a limited number available for sale on the CoinInvest online store, order yours now to save disappointment. As we have come to expect from the Royal Canadian Mint, the ¾ Grey Wolf silver coin is meticulously designed and struck to quality precision. On the reverse side is the image a lone grey wolf, standing on a rock in its natural habitat, howling signifying fortitude and strength. Along the top rim the country and date of issue are engraves and along the bottom are the words FINE SILVER ¾ ARGENT PUR, indicating the coins are struck in pure silver and weigh ¾ ounces. Below the image of the wolf are the numbers 9999 indicating the amount of pure silver content. On the obverse side is the portrait of Her Majesty Queen Elizabeth II. The image was created by Susan Blunt and has featured on RCM bullion coins since 2003. The denomination of 2 Dollars is indicated at the bottom. In 2014, North American gold bullion dealers, APMEX, teamed up with the Royal Canadian Mint to produce the ¾ oz Grey Wolf Silver coins to celebrate the revival of one of the nation's endangered species. The concept follows the success of the RCM's silver coin wildlife series that featured six coins produced bi-annually between 2011 and 2013. The RCM series included the Timber Wolf which is another name for the Grey Wolf. However, the coins can be distinguished from one another by their weight. The Grey Wolf coins produced exclusively for APMEX have a unique weight of ¾ oz. compared with the wildlife series coins which have a weight of 1.5 oz. In 1978, the Canis lupus, or Grey Wolf was put on the endangered species list of North America and Mexico after being hunted for years. The ancestor of the domestic dogs, the Grey Wolf has featured in tales of folklore and myth as aggressive animals although was recognized by the ancient Indians as a spiritual animal with great virtues. Around 30% of the world's population of Grey Wolves live in Canada and extends into the United States. Although the coin represents a lone wolf, these animals tend to stay in packs. Only the most dominant male and female mate to prevent the pack becoming too large. If another wolf tries to mate they will often leave the pack in order to find a mate – a courageous decision to make given the dangers a lone wolf faces in the wilderness. Established in 1907, the RCM is recognised as a world leader in producing high-quality coins. Meticulously rendered in .9999 fine Silver, the 2015 Grey Wolf Silver coin represents a noble tribute to the survival and bravery of the lone wolf and is among the world's purest coins. The RCM use the latest minting technologies in order to increase the security of their coins to protect investors. 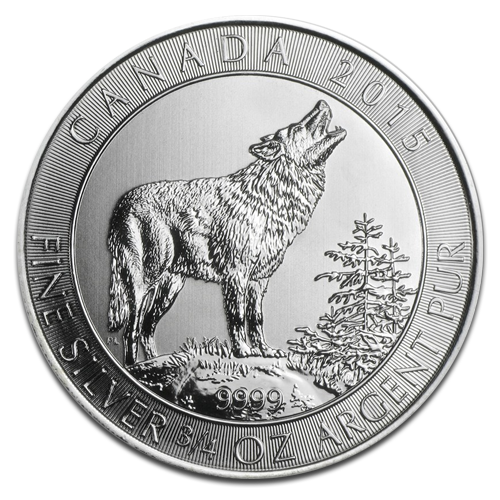 The 2015 Grey Wolf coins use the same radial line background first introduced on the 2013 Silver maple Leaf coin and is the latest security devise which makes these coins exceptionally difficult to counterfeit without being detected by bullion dealers. Buying bullion coins from the CoinInvest online store could not be easier. Simply login to your account, indicate how many coins you would like to purchase to the right of the image and add to your basket by clicking on the orange band. All you need to do then is tell us which country you live in and follow the online payment details. If you have any ¾ oz 2015 Grey Wolf coins for sale we would love to hear from you. As a leading bullion dealer, we offer highly competitive prices and will make you a fixed fee offer based on current market rates. All you have to do is contact a member of our staff and we will prepare an offer for you.